“I want to be able to make the same tomato salad every day, and have it taste different,” says Andreas Viestad, the Norwegian TV chef–turned–celebrity farmer. Here, he shares his cooking philosophy and his very best tomato recipes. Yet somehow I went from keeping a handful of tomato plants on the windowsill of my apartment in Oslo to growing hundreds of heirloom tomatoes—Black Zebra, Green Sausage, Banana Legs, Wild Guess and more—on a farm in the Elgin Valley outside of Cape Town. As a food writer and TV host—I explore Scandinavian culinary traditions on my television show, Perfect Day—I’ve always made an effort to get closer to the source of my food. Beyond those windowsill tomatoes, I have a small plot of land in southern Norway, where I grow a few potatoes and peas and raise chickens. Three years ago, my then-girlfriend (now wife) and I traveled to Cape Town to research my second cookbook, Where Flavor Was Born. Before returning to Norway, we decided to rent a house during the South African summers (November through February) and start a project called the Garden of Elgin. The garden, my experiment in creating flavor, is a collaboration with Dr. Paul Clüver on his family’s vineyard, where he makes excellent wines under the Paul Cluver and Seven Flags labels. 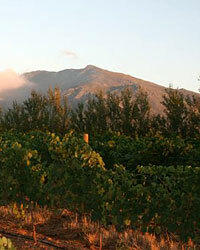 Much of his Elgin Valley property is part of a conservancy that lies along the Green Mountain Eco Route. Paul and I share a passion for farming and a belief in the environmental importance of biodiversity. Most farmers specialize in one particular crop, but we wanted to grow as many different varieties of fruits and vegetables as possible. The garden is a work in progress. We now have more than 50 different citruses, more than 40 kinds of peaches, nectarines and apricots and all kinds of herbs and vegetables, including more than 100 varieties of tomatoes. Some are greenish, some are brown, some are striped. Some don’t even look like tomatoes. When I show people a whitish, oblong tomato, they often refuse to accept that it is indeed a tomato (at least until I pick one and serve it to them). Every day, new tomato varieties ripen, and every day there is new excitement. What will they taste like? Will they be the best tomatoes we’ve ever grown? What can we use them for? Typically, the green and yellow ones are best raw, while the red ones are ideal for sauces. But I’ve learned that the color of a tomato matters less than the size. A large tomato will normally make a watery sauce that requires more time on the stove to thicken. During the wine-grape harvest, I feed the cellar workers linguine with heirloom tomatoes, herbs and baby zucchini. I modify the sauce every time I make it, sometimes using fresh fennel, often basil, sometimes oregano or marjoram. And the type of tomato always changes. There is a certain pleasure in using different types of tomatoes for the same recipe. It makes you less inclined to think, This is the way a dish should taste. Sometimes, cooking with a single ingredient so frequently teaches you about other ingredients along the way. For example, one of my favorite summer desserts is a tangy raspberry-and-cherry-tomato granita. The combination surprised me at first, because it is the delicate raspberry that provides the tartness, while the tomato mellows the flavors—not, as I had assumed, the other way around. When I began farming, I was looking to grow the perfect tomato. When our first San Marzanos—Italian plum tomatoes—started to ripen, I thought that they might be it. Then, when the first black-cherry tomatoes exploded with flavor, I was almost certain they were perfection. But there were always new varieties to try, some more tart, some mild, but all with an alluring, ephemeral sweetness. And now I know that my goal is not to find any single, perfect tomato; it’s about being able to make the same tomato salad every day, and have it taste different.